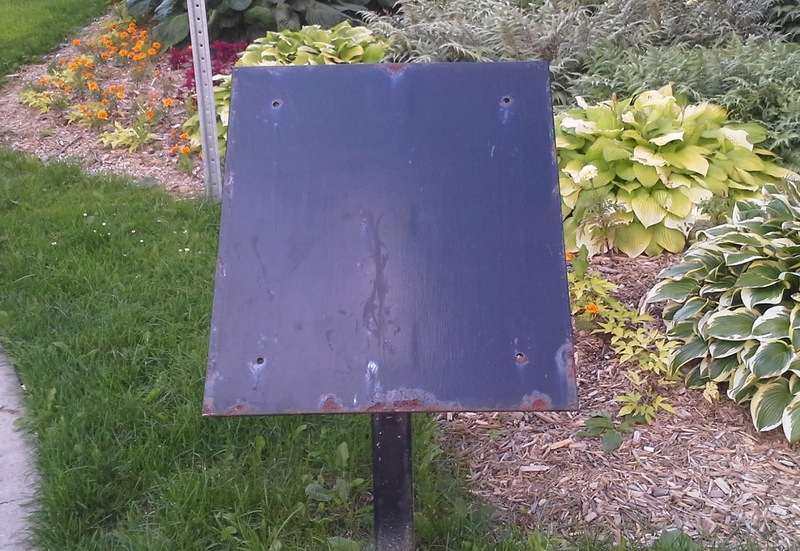 The plaque dedicated to William Saunders has been stolen from Campbell Park on Dundas Street. Saunders (1836-1914) was a local botanist and agriculturalist. He bought a farm east of London in 1869, planted fruit trees and began experiments in hybridization. He also found time to help establish the Canadian Pharmaceutical Society, be a director of Huron and Erie Savings and Loan, and teach in Western's medical school. Saunders Secondary School is named after him. If you want to see what his plaque looked like, see here. This isn't the only sign stolen recently. Missing from Gibbons Park are the Historic Sites & Monuments Board plaque to the IJC (International Joint Commission), the dedication plaque on the foot bridge, and numerous family memorials on benches or near trees. Meanwhile, at Eldon House, a cast iron garden cherub has apparently flown away. The thieves are hoping to sell these items as scrap metal but it's apparent not every metal recycler﻿ will take them without evidence of ownership. Once the thefts make the news, its even more difficult to sell "hot" metal. Notice that the thieves who stole the bell from Brick Street School found it too difficult to dispose of and eventually returned it. But it's too much to hope that many of these bits and pieces will be brought back. Let's all keep our eyes open for these items. And if you see anyone trying to steal some of our remaining plaques and monuments - from parks, museum grounds, or cemeteres - call the police. London's memories are not scrap. Update, July 21 - Well, at least the Eldon House cherub has returned, as mysteriously as it disappeared. Update, September - Now a baseball-themed birdhouse designed by Gordon Harrison has been stolen from Labatt Park. The birdhouse wasn't historic but it's been a nifty addition to the ball park since it was donated in 2013. Why can't some people see something attractive without feeling they have to have it for themselves? Update, October - The birdhouse has just been found nearby on Wilson Avenue, undamaged and complete. It will soon be back at Labatt Park.